I use a dip pen nib every day of my life and am therefor a leetle obsessive about them; a bad one can send me into a funk that poisons the whole household and probably scars my children permanently, but give me a good nib and I sing & dance like Donald O'Connor (which also scars my chil- but, never mind). Nibs can vary in quality within their species. Get 30 nibs of the exact same kind and hold them in your hand; half of 'em are OK-ish, 10 of 'em are decent and 5 are sweet, and, if you're real lucky, one is immortal, a Nib for the Ages (that adds up to 31, I know, I know). It all depends what you're after, of course. I'm after one that draws fine lines effortlessly, on edge or square on, upside down even, and does fat lines without spreading out too far and compromising the ink flow. It's usually immediately apparent how well the nib is going to perform, just by the feel of it dragging on the paper, or the tiny variations in shape of the tines. It's this finely calibrated nib-sense that makes my wife's eyes roll audibly in her head if I so much as say the word "nib". The Hunt Imperial nib is good for drawing, but it was designed for ornamental calligraphy, specifically copperplate or Spencerian calligraphy. This style, popular in the 19th century, used a fine pointed nib with flexible tines allowing for great variations in line width by hand pressure instead of nib width and angle, and it demands great skill and a good bit of flair to pull off. The 19th century was an explosive period for steel nibs, as I'm sure you'll remember from your high school history book, chapter 21, "The 19th Century; An Explosive Period for Steel Nibs". Though steel nibs (actually often bronze) had been around for a while, maybe as long ago as ancient Egypt, they were inferior in line-quality to reed pens or, later, quills. Quill pens were cheap and fairly easy to produce as long as enough geese were handy, but didn't last long and needed sharpening often. By the early 19th century, steel nibs were much improved in quality, but were horrendously expensive, costing about two day's pay for a laboring man. And they were produced laboriously by hand, being carved one at time out of a block of steel with a putty knife (this part's not true). But, as with the manufacture of most things during the Industrial Revolution, improvements were made. Birmingham, England was a center for the production of small metal objects, toys, jewelry, buckles and such, in fact it was one of the first manufacturing towns in the world, and the Jewellery Quarter is now an historic neighborhood. It was there in the early 1820s that John Mitchell began to apply button making technology to nib making, using a series of hand presses to shape, pierce and slit the nibs. Within ten or so years dozens of nib manufacturers had sprung up in the area, among them the firms of the Mitchell Brothers, Josiah Mason and Joseph Gillott, and at their peak they employed over 5,000 workers and produced an astonishing 1,500 million pen nibs a year, which wasn't too short of the world population at the time. Needless to say, the price of a steel nib dropped, from 12.5p each to 1.25p for a gross (144). At least one historian has said that this sudden affordability democratized writing and certainly it boosted literacy. 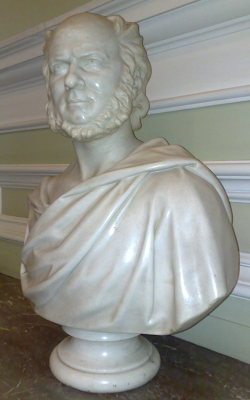 It was Joseph Gillott, however, originally a Sheffield cutler, and afterwards a workman in light steel articles, as buckles, chains, and other articles of that class, who in 1822 gave impulse to the steel-pen manufacture. Previous to his entering the business the pens were cut out with shears and finished with the file. 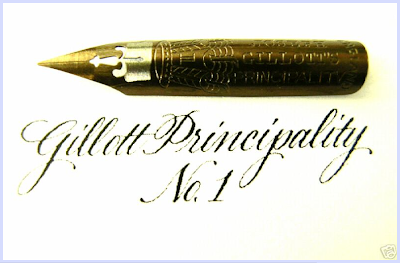 Gillott adapted the stamping press to the requirements of the manufacture, as cutting out the blanks, forming the slits, bending the metal, and impressing the maker's name on the pens. He also devised improved modes of preparing the metal for the action of the press, tempering, cleansing, and polishing, and, in short, many little details of manufacture necessary to give them the required flexibility to enable them to compete with the quill pen. One great difficulty to be overcome was their extreme hardness and stiffness; this was effected by making slits at the side in addition to the central one, which had previously been solely used. A further improvement, that of cross grinding the points, was subsequently adopted. The first gross of pens with three slits was sold for seven pounds. In 1830 the price was $2.00; in 1832, $1.50; in 1861, 12 cents, and a common variety for 4 cents a gross. About 9,300 tons of steel are annually consumed, the number of pens produced in England alone being about 8,000,000,000. 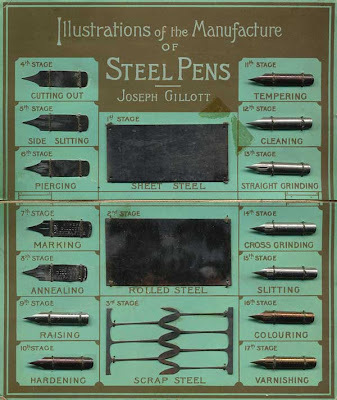 Gillott's firm produced many varieties of pen nibs, especially nibs designed for copperplate lettering. Their #303 was (and is) one of their most popular. But their greatest creation, their gold standard, was the fabulous Gillott Principality. Jeez, just look at that sweetheart, isn't it a pisser? As far as I can tell, it was only in production for a little over 20 years, but it was unmatched for flexibility and ease of ink flow. If you compare it to the Hunt Imperial, you can see the similarities, but also some differences, like the grinding marks and size of the vent hole. And how it just looks better made overall. 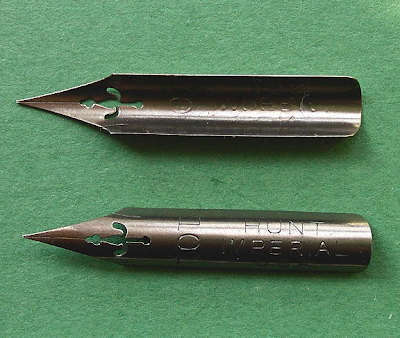 One mark of a well-made nib is a slight concavity of the tine's outer profile; it means they fit together evenly and therefor will work better. OK, my eyes are starting to roll audibly in my head. Suffice it to say, the Principality is one of the peaks of a now-diminished craft, and it's one that people who collect such things pay good money for. God knows how many hundreds of thousands, or millions, of these fine bits of steel were produced in the late 1800s, but the day when you could buy a gross for a few bucks are long gone. About six years ago a collector sold a gross of the Principalities as fund raiser for the Leukemia Society on eBay for $1,525, and individual ones go for about $20, or two days wages for a laboring man, if he has a crummy job. It's too late to make a long story short, but I just bought one of these things, unused, on eBay for less than $20, and I'm scared to touch it. And not just because the oil on my hand might effect the surface (many nibs have a coating that should be removed somehow so ink won't bead up on the metal; some old-time penman supposedly used to pop the nib into their mouth and let saliva do the trick, and no, I'm not going to try it). What I'm going to do is, seal it in lucite and put it in a tank filled with helium then bury it in the backyard. And when the economy heads south and nobody's buying cartoons, I'll trade it for fuel, liquor, breadfruit and copra. But in the meantime, guess what? The nib manufacturing firm Hiro Leonardt has started producing a nib closely based on the old Principality. It's called the Leonardt EF Principal, and I bought a handful of them, and dang, it's a nice nib to draw with. I'm sure I'm not using it correctly, as it's meant for ornamental lettering on smooth paper with iron gall ink instead of drawing goofy cartoons on vellum bristol with India ink, and I can feel it pulling ahead of me, like a racehorse forced to pull a garbage wagon. Maybe it's embarrassed. But it's also more responsive and better made than most of today's nibs, which for the most part are stamped out of aluminum foil by poorly-trained lemurs. So there ya go, a ray of hope in a dark world.